I always prepare pitlai with bitter gourd. For a change i wanted to try some varieties like bittergourd podi ,curry etc. At last I got the recipe for podi from a blog. Sorry friends ,i dont remember the blog name exactly.The dish was named as “Malathi chandur’s kakarakaya podi “..I did some changes according to our taste buds and tried. My hubby who hates Bittergourd likes to have this podi with plain rice.It doesn’t taste much bitter .Thanks to Mrs .Malathi chandur, a cookery expert & writer of many telugu novels for this yummy recipe. Asafetida /Hing – a pinch. Chop the bitter gourd into very small pieces ( chop as small as possible ). Add the required salt and mix well.Keep aside for 30 mins and squeeze the water that comes out from the bitter gourd. (this helps to remove its bitterness. ). For people who like its bitter taste can keep it for just 10 mins and proceed further. Take the tamarind and pinch into very small pieces.In a kadai, dry roast the tamarind pieces till it becomes dry. Remove in a plate. Heat 1/2 tbsp oil in the same kadai and saute the chopped onion till transparent. Add grated coconut, mix well and switch off the flame. Grind to a dry coarse powder adding roasted tamarind without adding water. Remove in a plate. In the same kadai ( no need to add oil), roast urad dal , channa dal , coriander seeds along with red chillies and hing. Cool and powder it fine or coarsely. Keep it seperately. Add 1.5 tbsp of oil in the kadai and saute the finely chopped bitter gourd pieces till it gets cooked. Once its cooked add the coarse ground powder and the coconut mixture to it. Mix well and check for salt. Yummy podi is ready to be mixed with plain rice topped by sesame oil. Here i have coarse ground everything.If u wish u can grind it to a fine powder. Wash and chop all the veggies and set aside. Wash and soak the rice in required water. (i soaked for 30 mins)Do not drain the water. In a broad kadai , add oil , jeera and the spices in the same order. Add the ginger , garlic pieces ..saute well and then add the finely chopped onions, slit green chillies.Saute till it becomes transparent. Finally add the chopped vegetables and the required salt. Transfer everything into a cooker and add 2 tsp of ghee to it. Cover and Cook for 1 whistle. 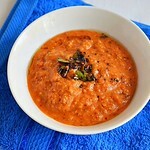 Serve hot with raita !! I learnt this podi recipe from my MIL..She makes the best thogayals and podis . We have this podi with idli/ dosa and plain rice topped with sesame oil.. Its a healthy and delicious podi variety. Heat a kadai with a tbsp of oil and add the red chilly, urad dal, pepper corns and hing. Roast till the dal changes to golden brown color. Transfer the roasted ingredients to a plate.switch off the flame. Leave it for sometime.. the curry leaves become crispy. Serve with idly / dosa or mix with plain rice by adding sesame oil. 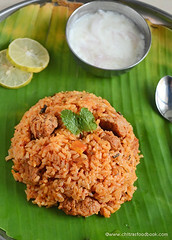 I learnt this from my neighbor.Yesterday when i was chatting with her , she told me about this garlic rice/ Poondu sadam . I tried on the same day .It was very tasty .I made it with the leftover rice I made for lunch.Its not necessary that the rice should be separate or grainy..Simple ingredients and can be made in jiffy. Pressure cook the rice and set aside. In a kadai , add 2 tbsp of oil and temper with mustard , urad dal and red chilly and curry leaves. Then add the crushed garlic , small onions, green chillies and saute till garlic turne golden brown. Finally add everything to the cooked rice and mix well by adding salt. Add a tbsp of coconut oil / ghee and serve hot !! 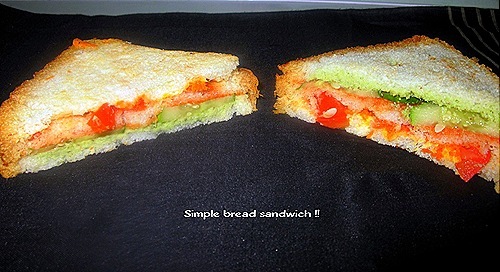 No side dish is required.If desired ,have with pickle.. In my chilly idly post , i got a comment from a fellow blogger asking for the recipes of sweets & onion murukku i prepared for diwali.So I am posting this for her & for my future reference. For kaju katli , i referred some blogs , got some ideas and then followed Mrs .Mallika Badrinath’s method .For Wheat flour ladoo , i took the recipe from Vah chef’s site. Home made Gulab Jamun , Khus Khus Halwa & Onion murukku recipes from my friend Shalini.I tried everything for the first time and I was satisfied with the outcome. Though i made some small mistakes , i learnt the technique of making perfect sugar syrup for different sweets and i got the confidence of making all these sweets perfect in future Everything comes by practice ,especially sweets isn’t it ? I prepared this sweet within 15 mins.. 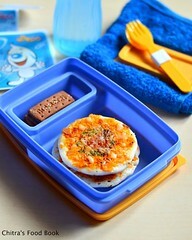 Very easy and ideal to prepare for surprise guests.. Melt ghee, add gram flour.Roast until color changes and leaves a nice aroma. Add the wheat flour and roast on a low flame till aroma spreads and it becomes a bit lumpy .Add the roasted cashew pieces and mix well. Remove from flame, cool it. Make ladoos by taking small portions of this mixture in your hands.. If u r not able to shape the balls, add more melted ghee , mix well and then shape it.. Please try this halwa only if u like the smell of khus khus. Some people hate the flavor of poppy seeds. Actually my frnd told me no need to add nutmeg but i added just to enhance the flavor of halwa. Powdered Nutmeg & cardamom – Little. Soak poppy seeds in hot water for 4 hours. Drain the excess water and grind to a smooth paste using little milk. Take the paste in a vessel and pressure cook for 1 whistle. Add sugar to the cooked paste and heat it in a heavy bottomed kadai stirring constantly. When it sticks to the bottom, add the ghee little by little. When complete moisture is absorbed and halwa gets a shine , add the rest of ghee , cardamom& nutmeg powders and remove from fire. Water – just to cover the sugar. Dry roast the cashews in a hot kadai without changing the color.Switch off the flame and leave the cashews in the kadai for 10 – 15 mins to make it crispy. Dry grind it in the mixie to make a fine powder . Run the mixie continuously till it becomes a nice powder.Transfer it to a wide bowl . Take the sugar in a bowl and add the water just to cover the sugar. Heat till it reaches **one string consistency.Add the essence to it.mix it well. Add the cashew powder and mix well until it forms a thick mass like chapathi dough ( should be slightly sticky and test it by making small balls).Takes 4-5 minutes..
Peel off the top sheet and decorate with silver warq. One more method suggested by mallika badrinath is , instead of adding the cashew powder in the sugar syrup, add sugar syrup to the powder. ie , after the single string is reached , remove the syrup from fire and add the cashew powder little by little like how u knead chapathi dough.It may not need all the syrup.Make a soft , smooth , non-sticky dough , roll and make shape. I've tried this method too. It will come out well.. Mix all the ingredients given above and bring it to a soft , pliable dough.Add the required water.Keep it aside for 15 minutes..Do not knead the dough much..
Make small balls without cracks and deep fry them in a low flame till it becomes soft. (plz dont fry till crispy and the ball should be evenly cooked) .Keep it aside. In a broad vessel make take the sugar and add equal amount of water.Allow it to dissolve completely by constant stirring in a low flame.Make sure the sugar syrup does not start to boil before it dissolves completely. Once it is dissolved , raise the flame and allow it to boil for 5- 7 mins.Add the kesar color when it boils.Add a few drops of lime juice to retain the consistency. Finally add the rose essence and switch off the flame.Add the jamuns when the syrup is hot. Leave it for an hour and serve !! Soak the rice in water for 2 hrs. Drain the water and grind it along with shallots and red chilly , salt to make a smooth batter .Add little water to grind. The batter should be thick & smooth. Then add the flours to it and mix well.Knead to make a chapathi dough. Put this in the murukku press with star mould in it. Press it in hot oil to make murukkus. If u feel the batter is watery, add little roasted gram flour / Pottukadalai maavu to bring it to dough consistency. I tried usili with vazhaipoo for the first time.It came out very well.I got this recipe from my MIL.I am posting this for my future reference and to share with u all !! Soak the dals for 1 hour and grind it course with red chilly,hing and salt.Add water only if necessary.Set aside.. Remove and let it cool.Crumble the mixture and set aside. Then heat a kadai with oil and do the tempering part.Add onions and saute well. Finally add the cooked usili to it and mix well. check for salt and add if necessary. 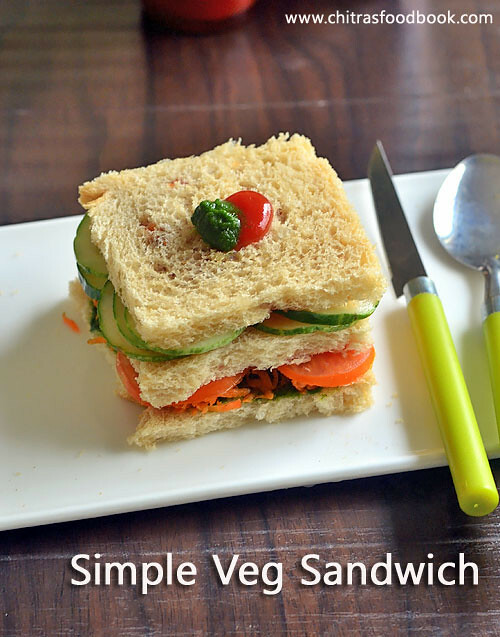 Serve with sambhar / curd rice..We usually mix this in plain rice adding sesame oil..!! I make these hotel style white chutney and red chutney for my guest usually. 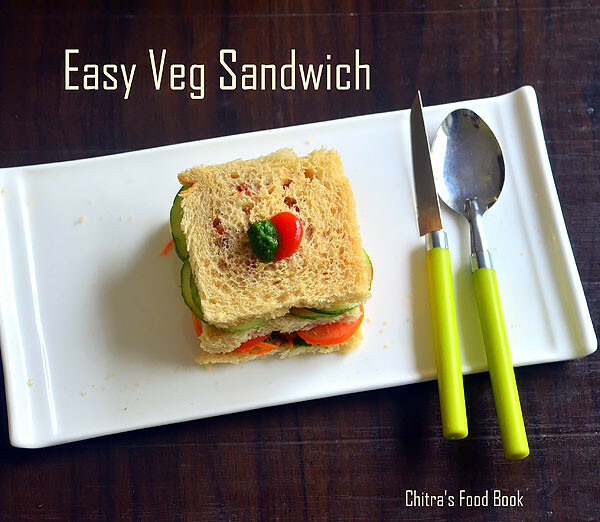 A very tasty & easy chutney to attract them.I got this recipe from a cook book.Please go through the variations i've given at the end of white chutney before you start doing . Coconut pieces – 2 tbsp or 1/8 cup of grated coconut. Heat a tbsp of oil and fry dry red chillies along with chopped onion until translucent. Now add chopped tomatoes and cook until it becomes soft and mushy. When done, let cool completely and grind along with asafetida, coconut and salt. Add water only if its necessary or to run the mixie. 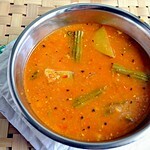 Heat a tsp of oil and temper using mustard, urad dal, red chili and curry leaves. 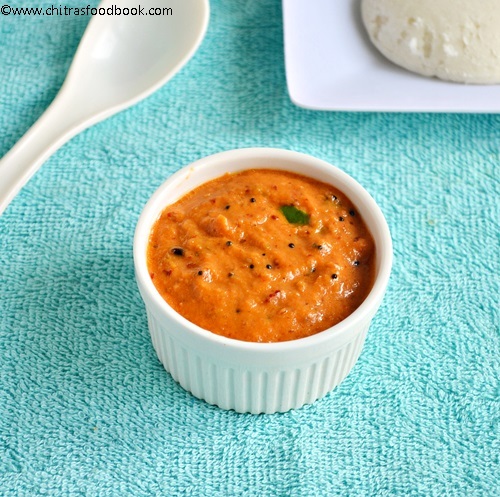 Serve a spoon drizzled with Gingely / sesame oil with idly or dosa !! Grind fresh grated coconut along with dalia, green chillies, garlic , small onion and salt.Add little water for thick chutney (For thin chutney add more water while grinding). In some hotels. they make it plain just by grinding coconut, green chilli, fried gram dal and salt. It comes out super white in color. You can try this way too. Heat oil, splutter mustard, split urad dal , red chilly and curry leaves..
Add this to the chutney and mix. 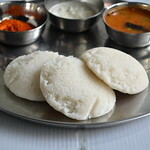 Serve fresh with idli/ dosa !! This chutney can be done by simply grinding coconut , green chillies & a piece of ginger to a smooth paste and temper at the end. In this method garlic and small onion is very important. 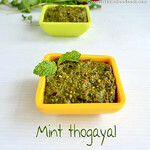 U can also add little coriander or mint leaves in this recipe to make hotel green chutney. To get a nice green color , just wash & saute the leaves in little oil before grinding and add..Soon i'll post another version of green chutney.. I've tried all the methods and everything tastes the best..
1. Ready made flakes or desiccated flakes or frozen grated coconut will work but don't expect taste and color. Thaw it before use else chutney will have oily look.Also you should use warm water for grinding. In Chennai hotels, Vada curry / Vadacurry is one of the most famous side dish served for idli and set dosa. 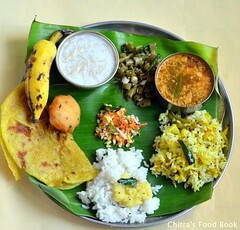 It is also popular in Chettinad regions. Generally people says vadakari is made out of left over masala vada / Paruppu vadai. Though I have not tasted original vada curry in Chennai, I have tasted in Salem Saravana bhavan hotel. But Sendhil had tasted the actual Madras vadacurry in Saidapet, when he was doing his Engineering in Guindy College. So he had promised me to take there during our next visit to Chennai. But I couldn’t resist trying it in my kitchen even before tasting the original Saidapetta vadacurry. After going through some of the hotel style vada curry recipes in magazines and websites, I prepared it finally. We just loved the vada cooked in tomato masala. Making vadacurry is not so difficult as I thought. 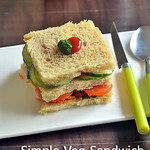 I prepared this for dinner as a side dish for idli, dosa. So I dint deep fry the vadas instead I steamed it along with idli. So its your choice of making it. As far as I know, vada curry should be thick in texture. But we always want the side dishes a bit watery & juicy .So I added little more water. Please reduce the amount of water and make it thick based on ur liking. 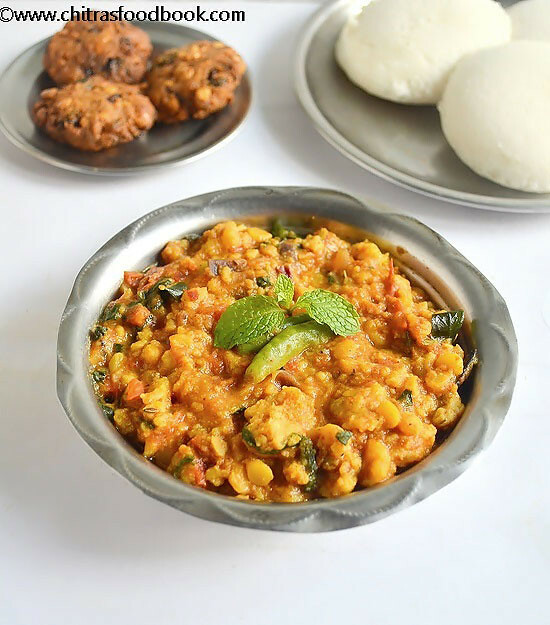 Lets see how to make South Indian Vada curry recipe. 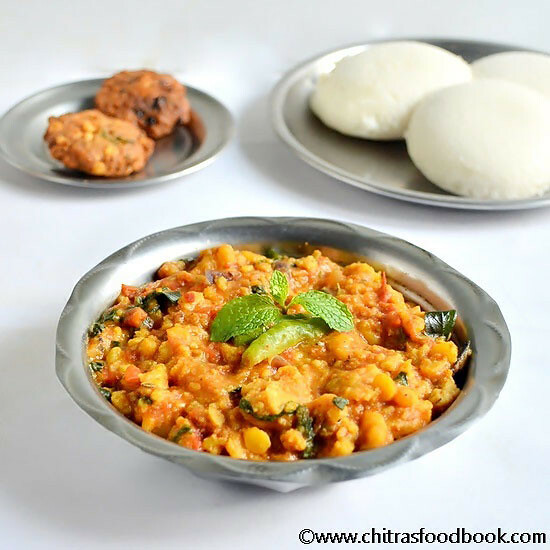 Vada curry recipe - Side dish for set dosa - A very popular dish from Chennai ! Wash and Soak the dal for minimum 2 hours and grind it along with red chillies, fennel seeds & salt to a coarse paste.Then add the finely chopped coriander leaves, mix well. Pinch small sized pieces of uneven shape out of the ground vada batter and steam it for 15-20 mins by keeping in idli plates OR Deep fry the vadas. Set aside. Alternatively, you can add the leftover masala vada pieces. Heat a kadai with a tbsp of oil, add the ingredients given under “To temper “ in the same order.Saute for a minute. Then add the onions & saute till transparent. Add the finely chopped tomatoes and saute well till it turns mushy. Add the chilly ,coriander & garam masala powders and mix well..Add water and cover cook it for 5 mins. Crumble the steamed / deep fried vadas and mix it with the gravy and allow it to boil for sometime till gravy thickens. Add water if necessary. Remove and Garnish with coriander leaves. Serve hot with idli/ dosa topped with sesame oil.Enjoy ! 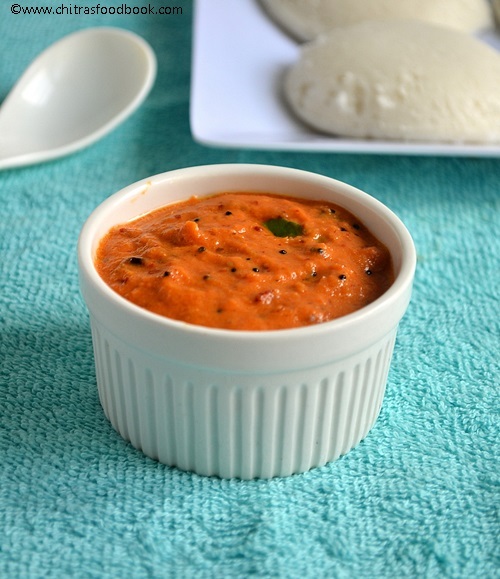 Enjoy this yummy vadacurry recipe with hot idli and dosa ! 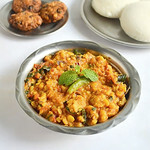 I wanted to send some side dishes something different from I usually make, for our sweet blogger friend Viki’s event..So I’ve given three distinct side dish recipes namely Potato capsicum curry, tomato gravy and sweet coconut powder with sugar, fried gram dal that goes very well with chapathi/roti. All these 3 side dishes are very easy and simple to make. Do give a shot ! I learnt this from my friend Shalini. 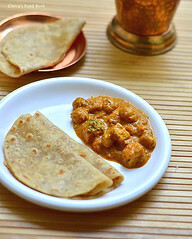 Normally I dont make dry curries for chapati.My husband likes to have gravies more than dry curries..So i was a little hesitant to do this.But my friend was telling for a long time..At last i tried yesterday along with an easy tomato gravy for safer side....But we liked it very much. I will make it more often.Thanks to Shalu ..This can be made in a jiffy..It took just 20 mins to finish including the cutting part. Water – Very little . Cut the above said veggies and set aside. Heat a kadai with oil and add mustard seeds. Once it splutters , add the chopped potato , capsicum & onion. Saute till they are half cooked. Then add the channa masala powder , salt & pepper powder.Mix it well and saute for a minute. Sprinkle little water and cover cook it for 2 mins. Sprinkle some more water if necessary. Cover cook till its done. 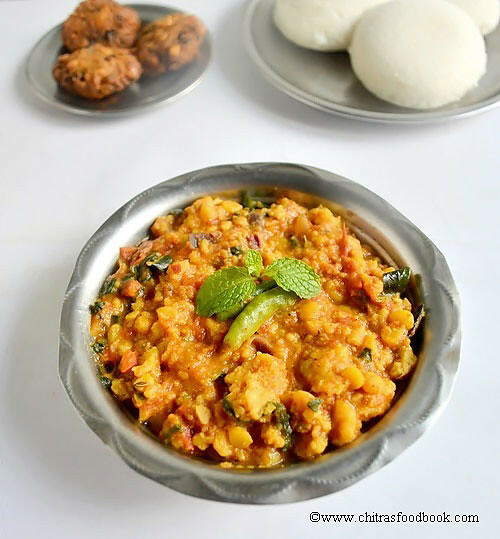 Remove & serve hot with chapathi. Coriander leaves – a few. Heat a kadai with oil and temper with ingredients given under “to temper “. Then add the onion slices & finely chopped tomato pieces. Saute well till the tomato becomes mushy. Add little water and cover cook till onions get cooked. Once the onions get cooked , add the ground masala with required water. Add the salt and let the gravy boil for sometime and gets thicken. Finally garnish with coriander leaves and serve hot !! I learnt this from my MIL. 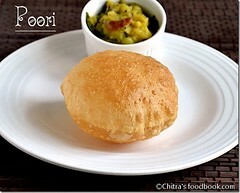 I am sure Kids would love this to have with chapathi & poori.I too prepared this for my kid i.e... My husband ;). People with sweet tooth can surely give this a try. I used sugar here..If u wish , u can replace with jaggery. Both tastes good. In a mixie , add coconut , cardamom and fried gram..Run it twice or thrice to make a powder. Finally add the sugar and run it once. Have a nice weekend . 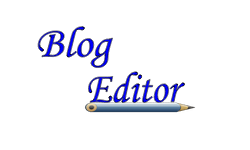 Catch you all in my next post. We had this arachuvitta vatha kuzhambu in a marriage function / Kalyana veedu. It was excellent. We all had 2 ,3 servings. One of my relatives asked the recipe from the cook and told my MIL. She tried at home and it came out well. Last week I made this for my husband’s lunch box along with chow chow kootu..It was a divinely combination. I stocked it and had for 2 days. Day by Day I found the taste got improved and made me thought, I could have made more quantity. So here comes the flavorful , Kalyana veedu style vatha kuzhambu..I’ve given the recipe for two people. You can increase the quantity based on your needs. Garlic – 10 – 12 flakes..
Soak tamarind in water for 15 mins and extract the juice from it using 1 cup of water. Add sambar powder,turmeric powder and salt to it..Keep aside. Heat oil in a kadai with 2 tbsp of oil and roast the turkey berries/sundakkai vathal till nice aroma arises. Remove and Set aside. In the remaining oil roast all the ingredients given under “roast & grind” in the same order. No need to roast the coconut. (Make sure no ingredient turns black.This will spoil the nice aroma of the gravy). Switch off the flame. Add the coconut, mix well. Cool and grind it to a paste by adding little water. Now add the roasted turkey berries to the paste and set aside. Heat the kadai with oil and add mustard seeds, chopped onion, chopped garlic and whole garlic flakes, chopped curry leaves and saute till garlic turns light golden brown with nice aroma. Saute in medium flame. Then add the tamarind extract and let it boil for sometime. Add the jaggery. Finally add the ground paste along with turkey berries and allow to boil for sometime. The gravy will become thick and reduce in volume. So add little water. It should neither be too thick nor watery. Last but not the least, add 2 tsp of gingely oil , mix it and cover for 30 minutes to 1 hour for the taste to infuse well. 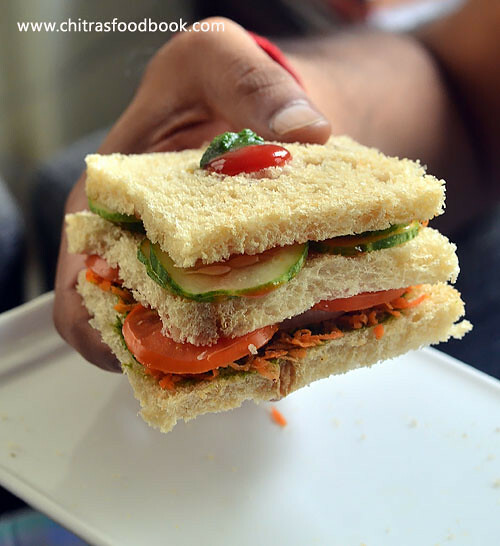 Serve with any kootu and papad!! It tasted best the next day. So prepare at least two, three hours in advance before serving if you are using on the same day to enjoy its best taste !! I’ve added the turkey berries at the end because I want it a bit crunchy..If u like, you can add with tamarind extract in the beginning. We usually grind this in flour mill and use it for 3-4 months …We use this powder for Sambar , vathakuzhambu , pitlai , poricha kuzhambu ,Kootu , poriyal and paruppu rasam.This powder plays the major role in our day-to-day cooking..We don’t use red chilly powder at all. This is an all rounder podi for us. For this kuzhambu , u can use any brand sambar powder or replace with 1 tsp of coriander powder and 1/2 tsp of red chillI powder. Bye.Catch u all in my next post.